Halloween Plants that will Scare the BOO out of you! It's a scary time of year! Plants are amazing life forms, coming in a wide array of forms, shapes, and colors. Here are some of my favorite Halloween plants that are sure to scare the living daylights out of you! 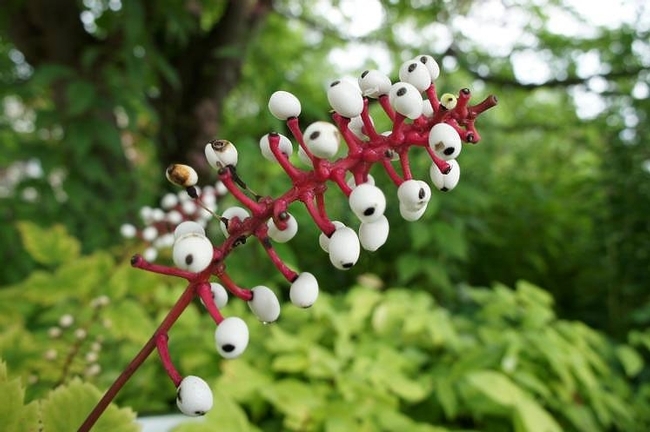 Doll's eyes plants are not only poisonous but host eyeball-like berries that are highly toxic to humans but don't harm most birds. Unless you're visiting friends or relatives or vacationing in the Midwest or Northeast USA you may never set your own orbs on this plant! 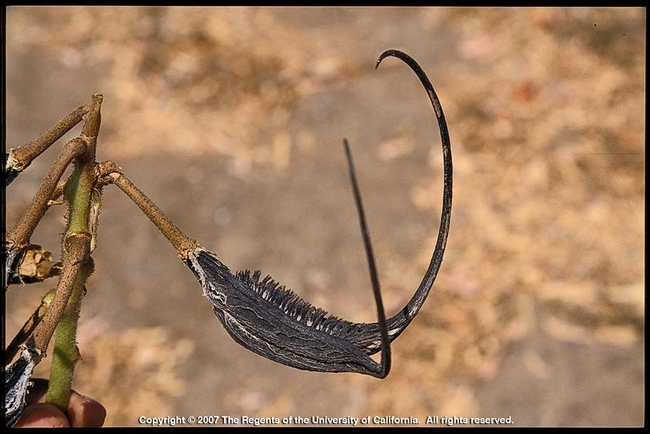 This unfriendly looking species is native to the South Central USA and sports a unique horn-shaped pod. In addition to its attention-grabbing visual appeal, pigments contained in the pod are used for black dyes by several Native American tribes. 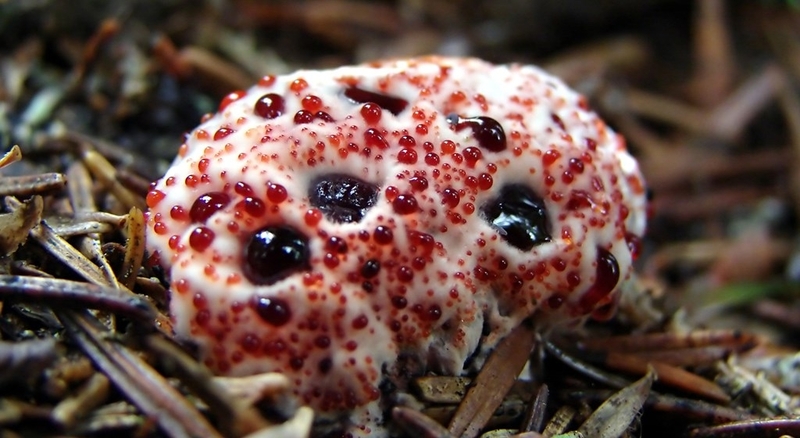 This startling-looking fungus oozes fake blood through minute pores. (The red goo is actually a result of guttation that forces water into the roots during osmosis.) Fortunately for Southern Californian's, it is found mostly in the Pacific Northwest and Europe living peaceably in a symbiosis with conifers. 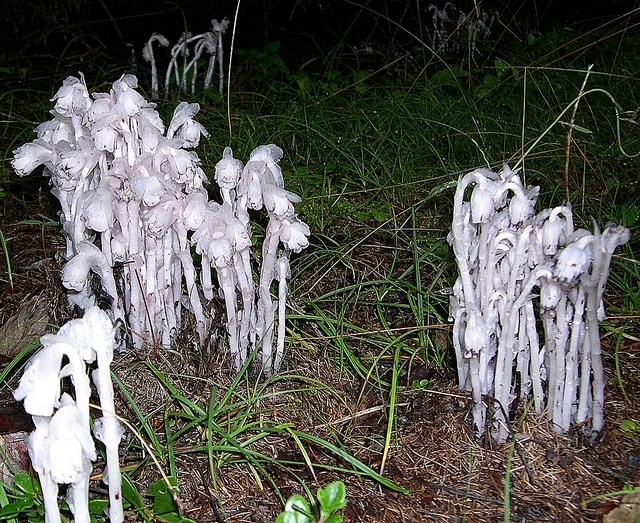 These eye-catching specimens have bright white droopy flowers reminiscent of ghosts found in spooky dark, dank basements. They hide in shady spots and live in a symbiotic relationship with a fungus in their roots providing food. Volunteers make a huge impact in counties across the entire state of California, from educating the public on sustainable landscaping practices to saving millions of gallons of water a year in home landscape use. Thank you for sharing your valuable time and volunteering with the UC Master Gardener Program. We hope you consider applying for reappointment and that you continue to serve as a volunteer for the UC Master Gardener Program for the next year fiscal year (July 1 – June 30). Volunteer appointments are made annually and serve as an agreement between the volunteer and the University of California. 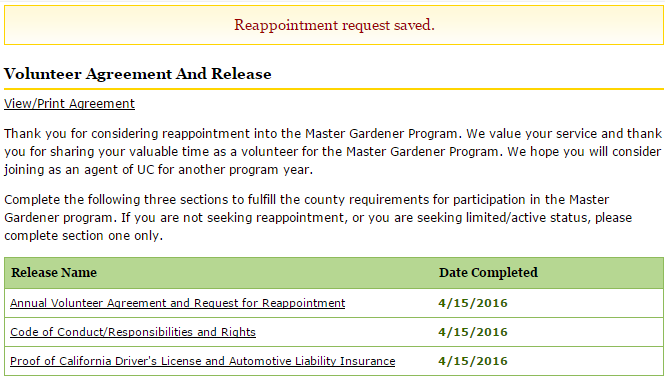 Annual reappointment is required for all volunteers working under the UC Division of Agriculture and Natural Resources and the UC Master Gardener Program. Please read this how-to guide thoroughly and direct any questions regarding the reappointment process to your county's Program Coordinator, Advisor or County Director. Reappointment begins June 1 and must be completed by all Active, Limited Active, First-Year, Gold Badge and Platinum Badge volunteers. If you haven't finished the process already, it can be done in three easy steps! 2015 marks the 45th anniversary of Earth Day, which is celebrated by more than 1 billion people worldwide. The national theme for this year's Earth Day is It's Our Turn to Lead, a phrase that directly describes the more than 6,000 UC Master Gardener volunteers actively leading in their local communities. UC Master Gardeners are passionate about conserving water, protecting the environment, managing pest, and most importantly love plants! Last year, UC Master Gardeners donated 385,260 volunteer hours to the program's mission of extending research-based home horticulture information to the public. UC Master Gardeners are critical in supporting UC Division of Agriculture and Natural Resources' (UC ANR) strategic initiatives for healthy communities, healthy environments and healthy plants across the state of California. 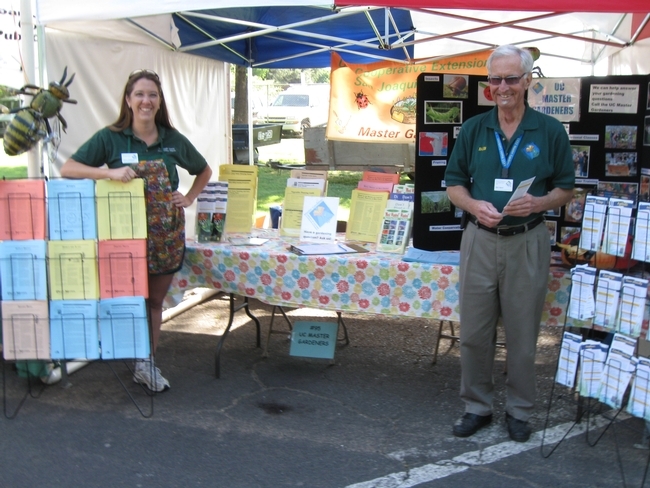 Perhaps you've seen your local UC Master Gardeners answering questions at the Farmer's Market or you've read an article by a volunteer in your local paper. If the 45th anniversary of Earth Day has inspired you to become more active with your environment, consider connecting with your local UC Master Gardener Program. UC Master Gardener volunteers receive University training in horticulture from experts in the field, mostly UC Cooperative Extension Advisors and Specialists. In exchange for training, UC Master Gardener volunteers extend research-based information on sustainable home horticulture practices to the public. Whether you are looking to reduce your landscape water use, grow tomatoes or even become a UC Master Gardener yourself, volunteers are ready to help you. Find a program or event near you! Standing in the usually snow-packed Sierra Nevada Mountains, Gov. Jerry Brown called for a mandatory reduction of water use across California the beginning of this month. 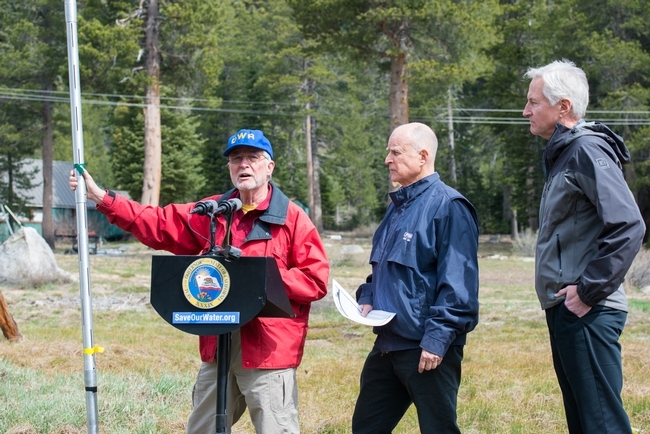 For the first time in the state a required water conservation action has been called, shedding light on the severity of California's drought conditions. At the direction of Gov. Brown the State Water Resources Control Board will require local water districts to impose a 25 percent water restrictions on all resident's water use. These new mandatory restrictions have left many home gardeners to wonder what this means for their home landscape. According to The California Garden Web, an informational website about gardening hosted by the UC Master Gardener Program, water use in the home landscape can often be easily reduced by 20 to 40 percent because overwatering is a common mistake by homeowners. Slowly start to reduce water supplied to plants over the course of a few weeks, giving the plants time to adapt to the change. It is important for residents to remember to not introduce new plants to your landscape during a severe drought. Even California native plants aren't drought-tolerant until they become well established. When water restrictions are lifted and new plants can be introduced, select drought-tolerant varieties appropriate for your climate zone. Planting in the fall as opposed to the spring allows plants to become established by winter rains. Residents should prioritize water use in their landscape, saving established trees and large shrubs first because they are typically more expensive to replace and require years to mature. 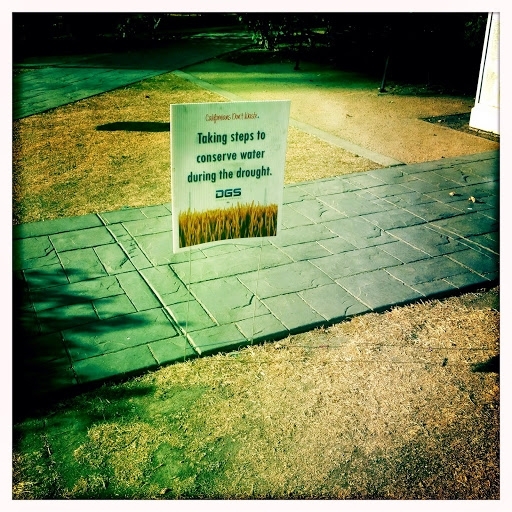 The lawn should be given a low water priority. As Brown stated during his address, “nice little green grass that gets water every day, that's going to be a thing of the past.” The lawn is often underused and typically mismanaged with overwatering in the home landscape. Lawn can easily be reestablished over a short period of time, or replaced with ground covers, mulches or hardscapes. If saving a lawn is a must, remember to mow your lawn higher during very warm weather and only water at night between 9 pm and 6 am. 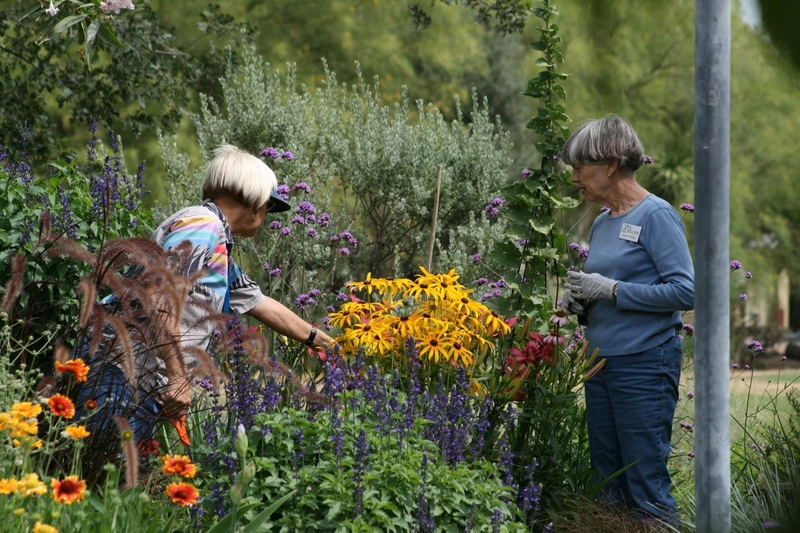 The UC Master Gardener Program has volunteers across the state, trained by University of California Cooperative Extension (UCCE), available to answer the public's questions about how to save established trees, plants and reduce water use in their yards. Many of the program's 50 county-based locations offer free to the public hotline services, home irrigation analysis and workshops for the public that are aimed at helping California's residents reduce their water use. Contact a local UC Master Gardener Program for more water saving information and resources. 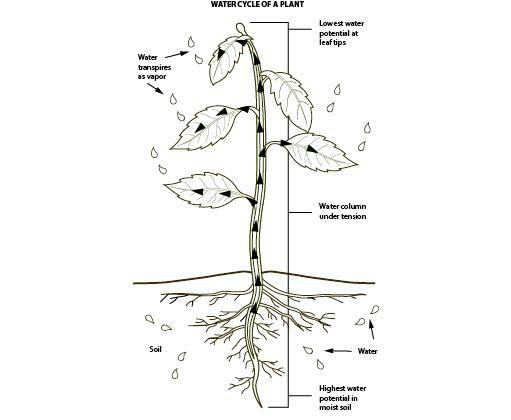 The new second edition of the California Master Gardener Handbook from the UC Division of Agriculture and Natural Resources (UC ANR) is a great resource for drought tips and home landscape water conservation methods. With an extensive chapter dedicated to water conservation methods, best practices for irrigation, plant selection, and tips for protecting water quality in urban landscapes. Another great option is to use the irrigation worksheet for homeowners that was recently developed by Dr. Loren Oki, CE Specialist, Landscape Horticulture with UC ANR and UC Davis. The worksheet is designed to calculate an irrigation schedule for a landscape zone for one calendar year. California Master Gardener Handbook - 2nd Edition - Has Arrived! The highly anticipated 2nd Edition - California Master Gardener Handbook has arrived and is available online for purchase to the public. 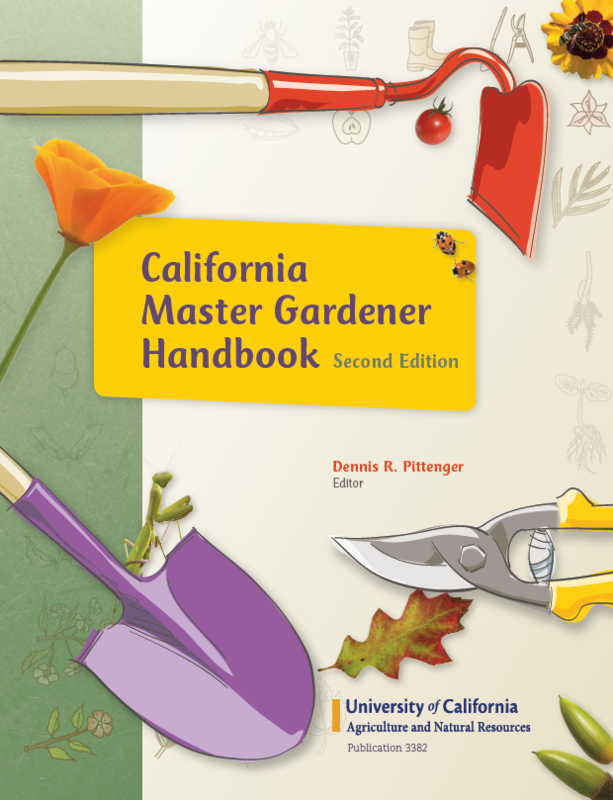 The California Master Gardener Handbook has been the premiere choice for gardening enthusiasts on the West Coast since it was first published in 2002. The trusted California Master Gardener handbook is a valuable resource that is packed with research-based information and more than 21 in-depth home horticulture topics. The handbook offers advice on home vegetable gardening, plant propagation, landscape design, insects, water management, weeds and much much more! The completely redesigned handbook has updated tables, graphics and color photos throughout. Technical information has been updated by University and industry experts and the handbook is more reader-friendly with a reorganized flow of information. New topics include invasive plant species and designing and maintaining landscapes for fire protection. New content was added on important topics including invasive plant species and designing and maintaining landscapes for fire protection. The poisonous plants chapter was completely rewritten by Judy Alsop, the former Director of the Calif. Poison Control Center, and there is an expanded chapter on water management in the home landscape. If you are a currently certified UC Master Gardener volunteer check with your local program coordinator about purchasing the new publication. 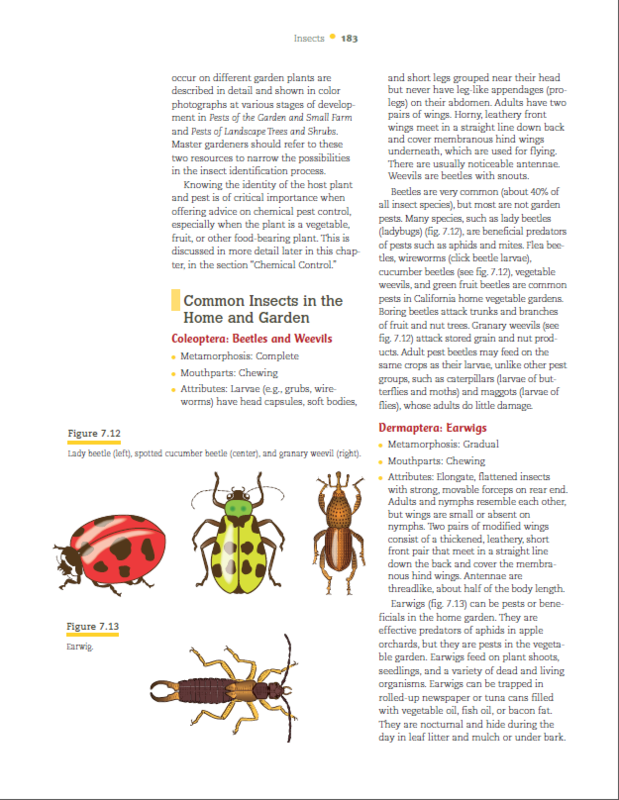 All active UC Master Gardeners receive a 40 percent discount on the publication which retails for $37 to the public. Members of the public can order a copy of the publication through a local UC Master Gardener Program or by using the UC ANR online catalog. Do you already have a copy of the new handbook? We'd love to hear your feedback in the comments section below!